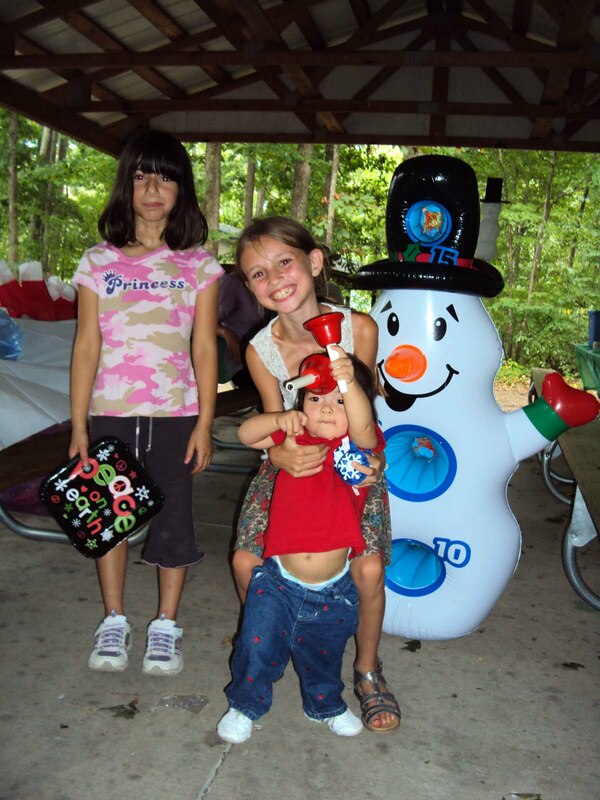 Our friends, the Allens, hosted a Christmas in July-turned-August party at Dan Nicholas park, yesterday. 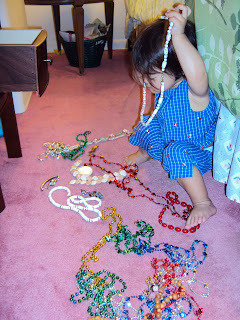 Since we watch Elizabeth during the week, we were able to help her get some of the decorations done leading up to the party. During the party, we hung out and made some Christmas crafts while listening to Christmas carols and eating Christmas cookies. We also brought items that will eventually be put into shoe boxes for Operation Christmas Child. Meeting John Baty for the first time! 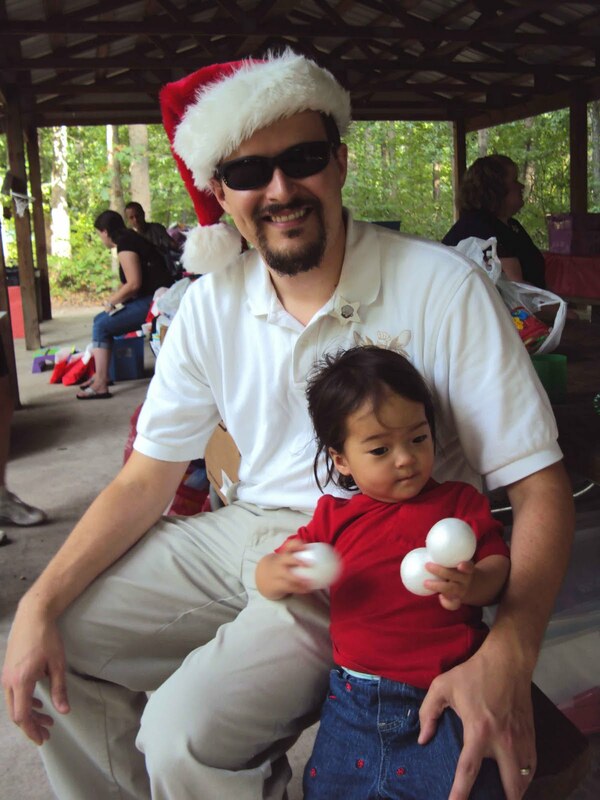 The Kinetic Church Baby Boom of 2011 has begun! All of the pregnant ladies at our church have started having their babies and with the babies comes the "meal train." We took dinner to the Charltons on Monday in celebration of the birth of their daughter, Kylie and tonight, we took dinner to our friends, the Batys. They just had a baby boy, last week. Katy, you loved sitting with me as I held the baby and you kept trying to give John his pacifier (whether or not he wanted it), and giving him sweet, gentle kisses. Every time I would say, "Be gentle, Katy," you would give the baby a kiss on the forehead. I think that you associate being gentle with giving a kiss. Welcome to the world, John Baty! Today was your 18 month doctor's visit with Dr. Guerriero, Katy. You are 33 inches high and weigh 22 pounds and 10 ounces. This puts you in the 86th percentile and 40th percentile, respectively. The doctor said that you are doing great and hitting/surpassing all of your milestones. I had to laugh when Dr. G. said that you should have five to ten words in your vocabulary by now! Your vocabulary is more like one hundred words! He also said that you should start making simple two word sentences by age two, but you already do that. You were super clingy with me as soon as you saw Dr. G. come in the room and you kept telling the nurse, "Bye-bye" as soon as you saw her. I think you knew that you were going to be getting some shots. To which, you received three shots today and of course, you cried all the way through them. However, the drama was short lived as soon as you got a sticker from the nurse for being such a good patient. All in all, you are a happy, healthy, active toddler! 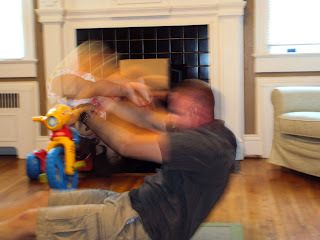 Ab and Arm work out for Uncle Rob! Katy loved standing behind Rob and having him flip her over his head so that she would land in his lap. She kept saying, "More, more!" 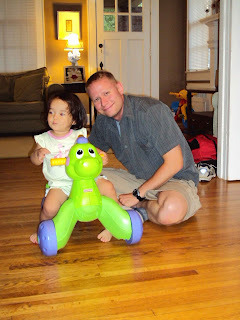 Katy loved rolling back and forth on her Dino between Daddy and Uncle Rob. Uncle Rob is back from being deployed with the Army for the last six months. We are thankful that he came home safely. He was in NC, this past weekend, before moving to Hawaii at the end of the month. He spent the weekend with us and you had fun playing with your Uncle "Wob." It took you a couple of minutes to warm up to him, but afterwards, you were playing and laughing and asking, "More, more!" of whatever game the two of your were playing, Katy! It was good to spend some quality time with Rob (We're sad that we didn't get to spend time with Aunt "Ghoulie" as Katy pronounces it, too!) before he moves. -Children definitely learn by example and repetition. 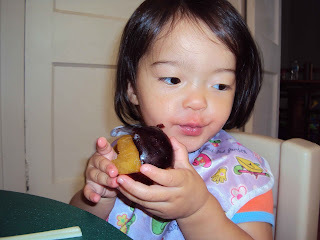 The whole phrase, "Children are like sponges," is so true! We didn't realize that always say a mealtime blessing would become so ingrained until Katy started insisting that we say prayers before we eat- even before snacks! -Know your child, know yourself. I remember this one time when Katy had a cough that wouldn't go away. I called the doctor's office about it a couple of times but they said it could be teething, could be a slight cold but nothing much to worry about. Finally, after a week and a half, I knew that this was more than just the sniffles and I insisted on taking Katy to see a doctor. Turns out that it was a sinus infection that needed medication. Nobody knows your child like you do- trust that maternal instinct when something seems a bit "off." 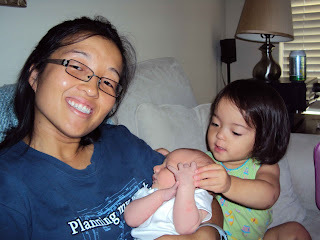 -Life after having a child is challenging at every stage. At first, it's the whole "new parent, getting used to it" stage. Then, it's feeding all the time. Then it's, setting patterns and routine. Then teething, crawling, cruising, walking, talking, running. Every stage is hard in the moment but rewarding just the same. -Gone are the days of walking out the door with just my wallet. Nowadays, it's diapers, wipes, snacks, toys for entertainment, EpiPen, extra change of clothes, bib, etc., etc. -After having a baby, life is measured by very small increments- ounces, number of dirty diapers, number of naps, hours of sleeplessness, bites of vegetables, wardrobe changes, toys played with/put away, attention span. -Little girls definitely have the CLOTHES!!! -You can try to teach gender neutrality, but in the end, girls with be girls- complete with a shoe and purse fetish at the ripe old age of 18 months! -Yo Gaba Gaba is infinitely more entertaining when watched through the eyes of your baby (and mocked by with fellow parents of toddlers). -Having a child is full of hard choices all in the name of having and raising a child; Choosing to go back to work, then quit work to stay home with Katy, taking a long, hard look at the budget in order to stay home, saving and sacrificing in order to afford baby, Friday nights in, etc. 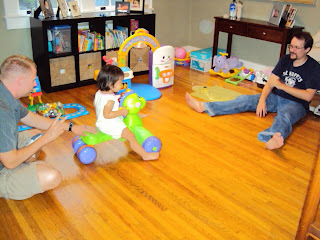 -Our dining room has gone from a place to eat dinner to a place for Katy to play. -Ted's Art Room has turned into the office/guest/Katy's upstairs playroom with a complete Ikea makeover. 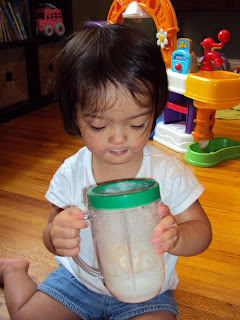 -I have learned a lot about what goes into the foods that we eat, thanks to Katy's allergies to soy, nuts and eggs. It has been a real eye-opener to see what goes into our bodies. It has also been a catalyst for our family to eat better, too. I've learned various brands that she can and cannot eat. -A mother is the supreme multi-tasker. -Phone calls for business are near-impossible with a toddler playing, crying, laughing and screaming in the background. -You learn to cram a lot of chores and tasks into short windows of time. Unload, load the dishwasher, get dinner ready, make a phone call, clean up the toys, check emails, blog, make the bed, sort the mail and recycle all in the span of one naptime! -I will do just about anything in order to get- and keep- Katy asleep during naptime and nighttime. -Routine is subject to change at any given moment. -As a parent, you are much less inhibited. 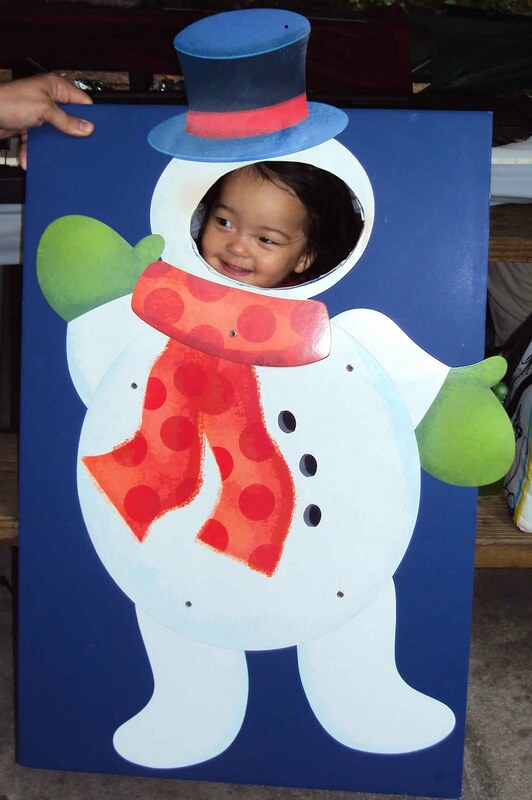 You will dance, make silly faces and break out into nursery rhymes at any moment- all in the name of entertaining your child- even and especially in public. You don't care who is watching you as long as your child is happy! -If baby is happy, mommy is happy. -Raising a child is a lot of HARD work and not for the faint at heart! -Having a child is a lot of fun! 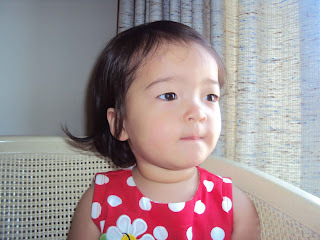 Today you are 18 months old, Katy. 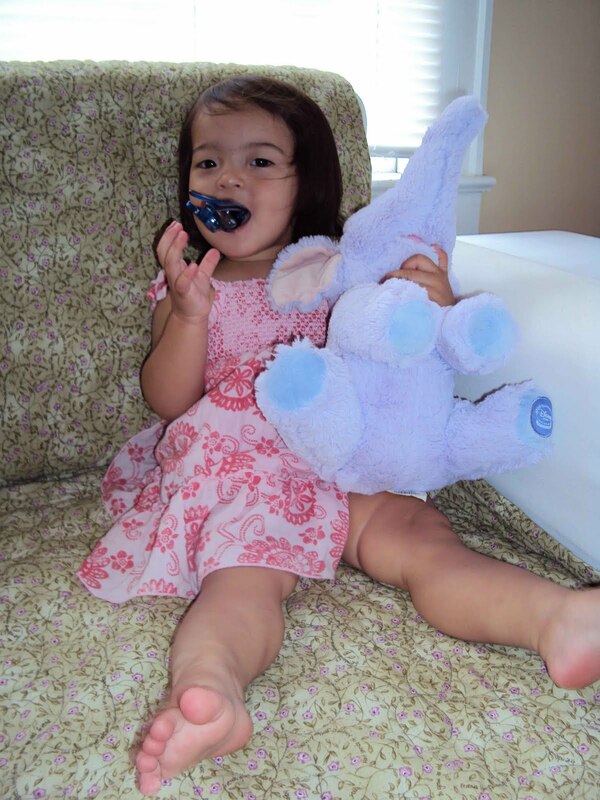 By now, you are most definitely a toddler- running around, talking up a storm and learning how to put things together, take them apart and exploring new ways to get into trouble. Right now, you have 12 teeth- six on the top and six on the bottom, four of them are molars. They currently look pretty straight, though it does look like you may have an under bite (Sorry, Girlie- you inherited that one from me). The dentist doesn't seem too concerned about it, yet, but she said that she'll keep an eye on it. 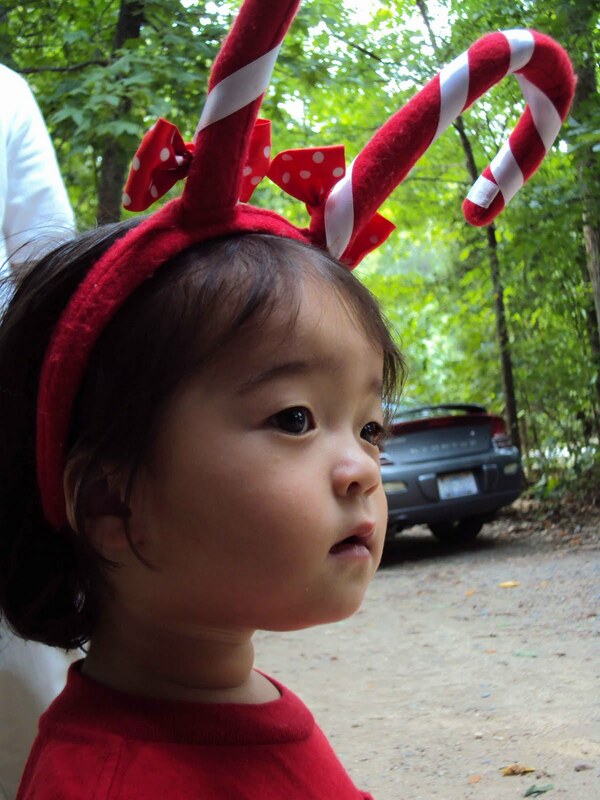 You are quite the little chatterbox, Katy! You are quite verbal in your expression and you have a pretty good vocabulary for an 18 month old. Not only do you say a bunch of words, but within the last several weeks, you have also started putting words together to form short two or three word sentences. So far, we've heard, "All Done! ", "All done, Mommy! ", "Night, night Dada", "I pee" (after the fact, of course), "Up, peas! ", "Baby sleeping", "More milk", "Mommy down" (when you want me to sit down next to you), "Help peas", "Go walk" and several other simple sentences. Music really gets you going and you love to dance and bounce when you hear music. Your current favorite CD is from our friends, Mr. and Mrs. Keys. You request this CD by name when you call out, "More gack, gack" or "Gack, gack peas!" We have some other, jazzier children's CDs in which you start to jam out as soon as you hear the opening notes. The ABCs are another favorite song and you like to swing your arms around and bounce up and down whenever one of your umpteen many toys starts playing the tune. By now, you are pretty fluid in your movement. Walking is more like running and like I said before, you now understand the concept of dancing and swaying along to music. You like to twirl and spin around in wide, open spaces. You can scale furniture and playground equipment with the dexterity of a monkey. We've even seen you try to jump up and down. Only once did I see you actually get some air between you and the ground. When we go for a walk, you balk at the use of a stroller and insist on walking by yourself. You have no fear or inhibitions when it comes to climbing, bouncing, running, swinging or anything else wild and rambunctious. 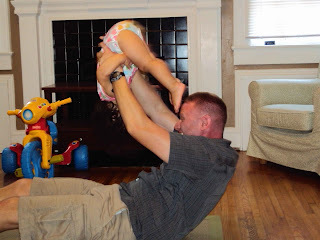 You love when Daddy wrestles with you, Katy- the wilder, the better! 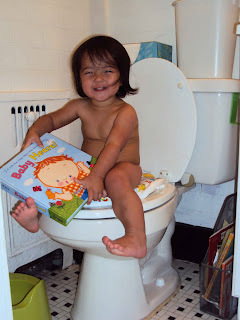 We are still in the midst of potty training. You understand the concept of having a soiled diaper, and sometimes you will let us know that you need a diaper change. However, more often than not, you let us know just after the fact and not beforehand. You get a sticker for each time you sit on the toilet as an incentive. Sometimes it works, sometimes it doesn't. You are a good eater, Katy! You eat table food exclusively (with the exception of being with cousin Molly and wanting whatever she is eating). Breakfast is your best meal of the day. I would say that your current favorite food is my homemade yogurt with a little bit of homemade strawberry jam. A close second would be veggie sticks. With the exception of your distinct aversion to all things veggie, you maintain a healthy diet of whole grains, dairy, some meats and lots of fruit. You enjoy eating homemade bread, macaroni and cheese (I mix in cut up pieces of meat and veggies to the mac and cheese to make a more complete meal), cottage cheese, most fruits (cantaloupe, watermelon, grapes, strawberries, blueberries, bananas, mangoes), string cheese, bits of turkey, ham, roast beef, cucumbers, mushrooms, oatmeal, raisins, Raisin Bran Crunch cereal, pancakes, sweet potatoes, knishes, and more. You have definite ides of what you do and do not want to eat and you let your opinions be known! We've gotten more vigilant about keeping eggs, soy and nuts out of your diet. It took a little getting used to at first, but now, it's getting easier. 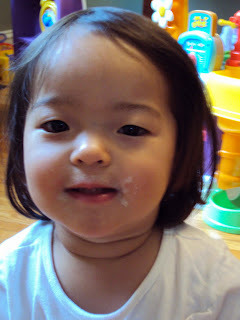 Your skin and diaper rashes tend to be fewer and less dramatic, thanks to the lack of eggs, soy and nuts in your diet. Your sleep patterns have improved, though, you still do not sleep straight through the night, Katy! I had hoped that you'd outgrow this by now, but I fear that it will be a lifelong struggle. You sleep on a mattress on the floor in your bedroom. There is no need for the "ghetto crib," anymore. On occasion you do fall off of the mattress and onto the floor and that usually warrants a cry. Daddy and I take turns every other night taking care of you. This arrangement has made it better for at least one of us to get some consistent, long stretches of sleep each night. I still have to be the one to put you down to sleep each night, though. You typically get ten hours of sleep each night and take one one to two hour afternoon nap each day. Naps tend to go smoother than nighttime, with you falling asleep quicker and staying asleep on your mattress by yourself for longer periods of time. 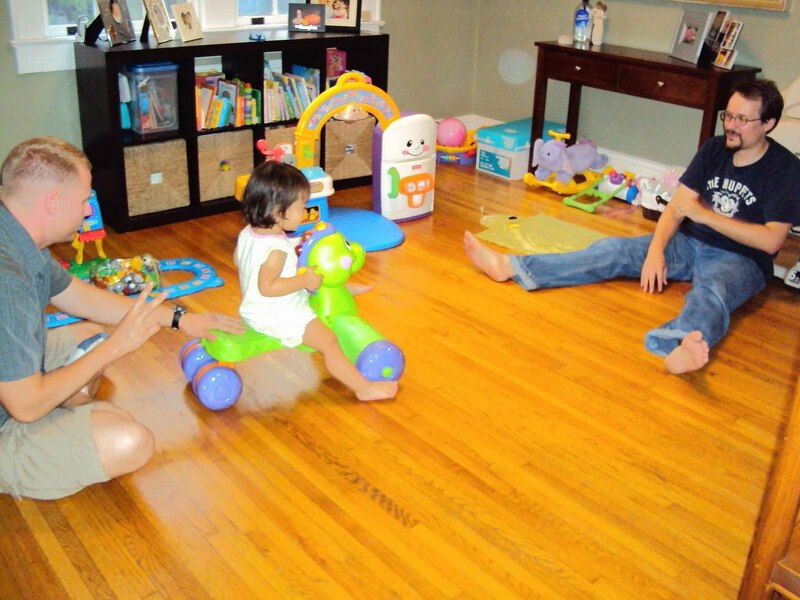 Your favorite toy of choice, at this moment, is probably your Asian Dolly from Grandma and Pop-Pop Tinkey. You love to hold Dolly, give her kisses and pat and rock her just like I rock you to sleep. I've seen you try to feed and dress Dolly, push her in her stroller and even talk and read to Dolly. I've seen you play "pretend" a lot more, lately, too. You will "cook" something on your play stove and try to "eat" whatever you just made. You will lay on the floor with Elizabeth's cars and drive them around saying, "Vroom, vroom!" just like Elizabeth plays. You find enjoyment in putting on Daddy and my hats, clothes, shoes and purses. Speaking of which, you are quite the little fashionista! You love shoes and purses and you are very particular about what clothes you do and do not want to wear on any given day. If I pull out an outfit that you do not want to wear, you will let me know by throwing yourself down on the floor in distress. You even like to accessorize with headbands and jewelry. Another little obsession of yours is the fact that you love to wash your hands. I admit, you got that one from both Daddy and I as we both tend to be germ-a-phobes. Rarely can we pass a sink without you insisting, "Hands, hands- soap!" You love to play with water fountains and you call all things related to water, "Bubbles." You love puppies and babies, Katy. You are always quick to point either out as we go for our daily walks. You can spot a dog a mile away! 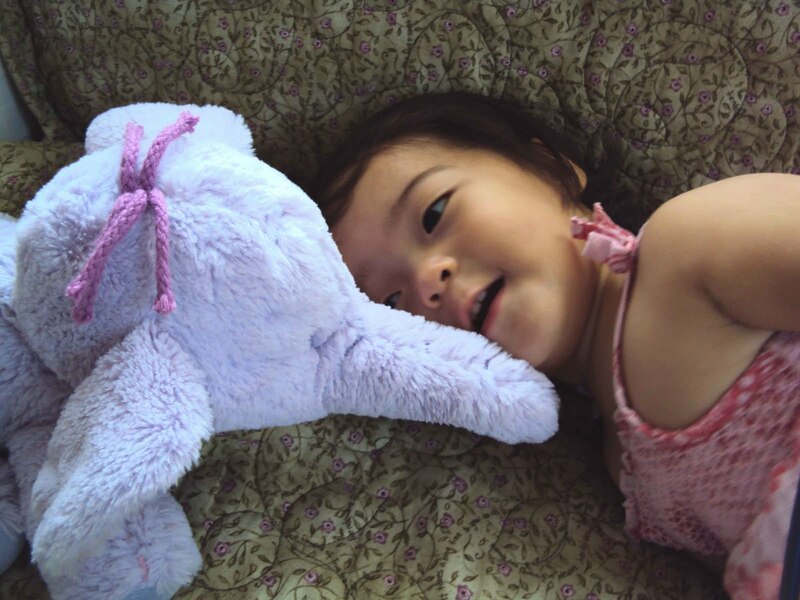 Every time I tell you to, "Be gentle" to a baby, you kiss the baby's forehead as if you relate gentleness with kisses- so cute! You have an understanding that certain things go in order. For example, you know that as soon as I finish changing your diaper, I will always reach for the anti-bacterial gel. I know this because every time I finish changing your diaper, you will sit up, reach for the anti-bacterial gel and say, "Hands, hands!" Another example, is every time we sit down for a meal and/or snack, you fold your hands and exclaim, "Prayers!" or "Amen" as a reminder that we need to say a blessing. We are trying to work on getting you to say the prayers, Katy, but the closest we got was, "God, food, Amen!" Your currently wear size 18 month clothing. You can still fit into some 12 month clothing, thought they are starting to get too short. According to Auntie Hope and Uncle Eric's Wii, you weight 23 lbs. and 1 ounce. Your official 18 month doctor's appointment isn't till next week, so I'll report those stats as I get them. I can definitely tell that your growth has started to slow down. When I see you compared to other children your age, you tend to be on the smaller side for both height and weight. Good-bye 90th percentile! I love your sweet baby kisses, Katy! I love when I say, "Give Mama kisses, Katy!" and you pucker up your little lips and give me a kiss. You've gotten very good at blowing kisses, too. 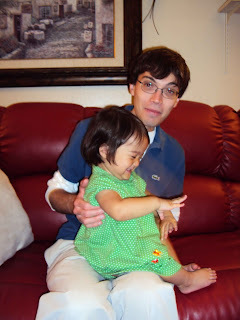 18 months is a fun age for me to experience with you, Katy! I can just see the wheels turning in that little head of yours. You will observe something done once and then try to do it yourself. 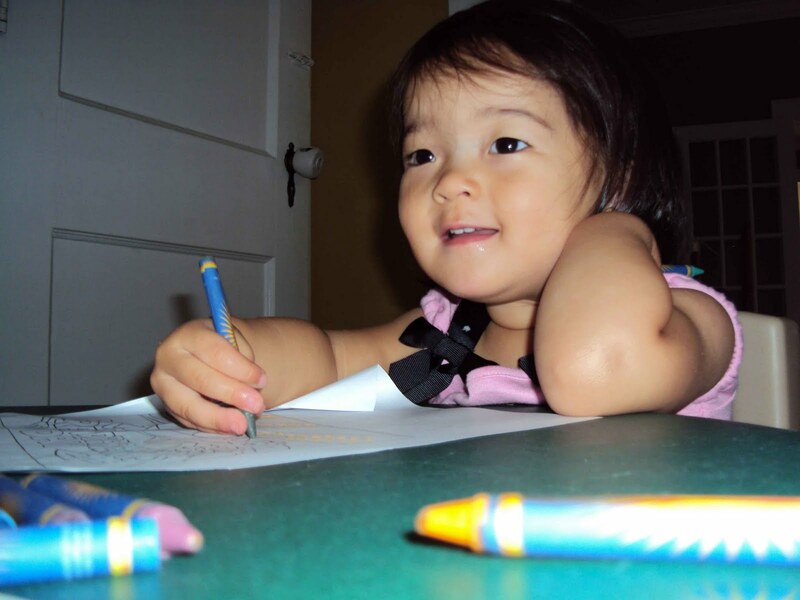 For example, you saw Daddy click a pen so that the ink tip was extended and you immediately understood that was how to get the pen to write. I'm enjoying that we can understand more of your wants and needs as you get more verbal. Of course, with that verbalization, also comes more independence and stubbornness. You are smiley, happy toddler and I love to watch your expressions as you play. "This ice 'copy' sure looks yummy!" "Gulp, gulp, gulp! I'll help myself, thank you!" Katy, you love to call coffee, "copy." 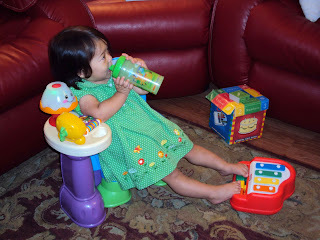 Every time Daddy or I reach for our morning cup of joe, you reach your hands up and desperately cry out, "Copy, copy! Me copy!" Since the weather has been quite warm lately, I've been drinking my coffee iced. Even though the coffee is iced, you know that it's "copy" and you always want some. So, yesterday, after I had finished my coffee, I gave you the left over ice cubes (no need to give you real coffee because I have enough problems as it is getting you to sleep at night without the help of added caffeine) and you were in seventh heaven thinking that I had given you "copy." My little caffeine fiend! Before you were born, Katy, Daddy and I had a slight obsession with the semi-newly created purple Winnie the Pooh character, Lumpy. We went as far as to collect various Lumpy stuffed animals, toys, blankets, etc. under the guise that you would one day like this cheerful British-speaking Heffalump as much as we do. Daddy was convinced that you first word would be, "Lumpy," but, alas, it was not (instead, it was "Mama," much to my own personal delight). You've said a lot of words up until this point, but none of them were "Lumpy." That is until yesterday. Yesterday, as clear as a bell, you pointed to your pile of Lumpy stuffed animals and said, "Lummie." Then, you carried "Lummie" around for the rest of the afternoon. 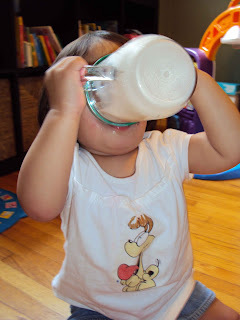 You even said, "Lummie" in your sleep, last night. Katy, you sure must have a lot to say because recently, I've noticed that you now talk in your sleep. While we were in Florida the first night, you burst out with, "Pop-Pop!" followed by giggles. This was at about three AM, yet you were sound asleep. Of course, this woke me right up, thinking something was wrong. The next night, you burst out with, "Puppy!" and "No, no!" Since then, both Daddy and I have experienced you talking in your sleep. You've said, "Hope", "All done! ", "No, no!" and lots of giggling. Katy loved the slide! 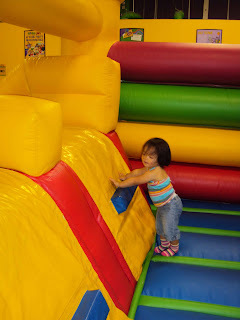 She kept sliding down over and over and over and over again! 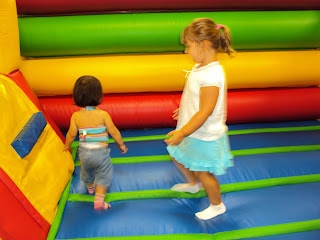 Abby helps Katy in the bounce house. "Waaah! Are we there, yet?!" Pop-Pop Tinkey was the guest preacher at College Park Presbyterian Church. So, we went along with him to hear him preach. You weren't too happy with us when we put you in the nursery, Katy. Grandma Tinkey had to sit with you for a little bit before you would stop clinging to her and quivering your lower lip in protest of being left. When I came to pick you up from the nursery, I was told that you did pretty well and that you liked when the teachers played music. They said that you danced and twirled to the music but every time the door opened, you would start crying because you were expecting me. Such a mama's girl! After church, we went over to Uncle Jeff and Aunt Lee's for lunch. 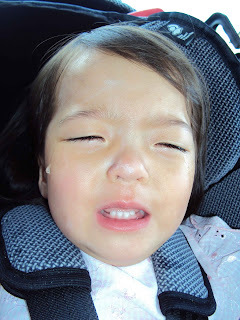 You fell asleep on the way home from church but woke up mid-drive and you let us know that you were not happy! You wailed and cried pretty much the whole way to Uncle Jeff's house. I think it was just so many changes in a short amount of time that had you all out of sorts- beach, long drive, grandparents' house, different church with different people, more driving, etc. Once we got to the Tinkey's, all distress was forgotten as you saw their two dogs. You love, love, love puppies, Katy! 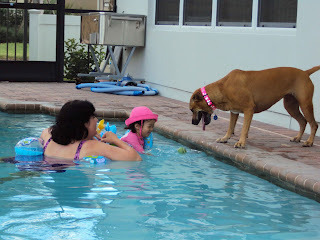 You really enjoyed playing ball with Lexi, the dog, in the pool. While we were enjoying a delicious meal prepared by Aunt Lee, you kept insisting on going into the "bubbles" (your word for all things water- ocean, pool, fountain- are all called "bubbles."). You were not happy when a quick storm prevented you from taking a dive into the pool. Most of the week in Florida was spent relaxing and meeting up with friends. We got to see my friend David Smith Tuesday morning. 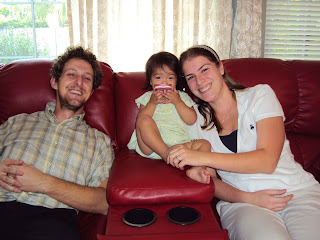 You loved playing with David and he was a good sport in indulging your toddler play. I finally got to meet my friend, Dan O'Donnell's wife, Johanna, Tuesday night. The O'Donnells came over to the house to meet you, Katy, and then just the adults went out to eat and catch up. It was good to see my friends and get up to date on each other's lives. David Smith made the comment that I've known him half of my life- can you believe that?? That makes me sound old but its so good to have friends that have known you that long. We took walks on the Cady Way Trail, playing with all of the toys Grandma and Pop-Pop have accumulated at their house, swimming in their pool, discovering a nearby park. Most of all, you enjoyed playing with puppy. 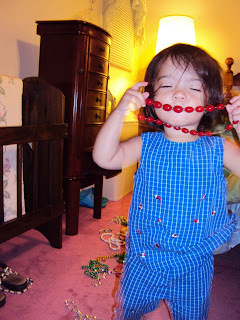 At first you were a little scared of Pebbles but it didn't take you long to get over your fears and start terrorizing Pebbles all throughout the house. Every morning the first words out of your mouth were, "Puppy?" as you went looking for him. 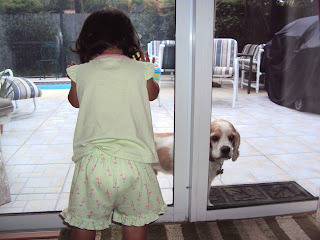 You loved to try and pull Pebbles' tail and I even caught you trying to crawl into his dog bed with him. You even said a simple sentence in reference to Pebbles, "Puppy sleeping." We had a busy Friday! First, we went downtown Winter Park for a little shopping. Then, we visited Pop-Pop at the Towers where you were once again, the talk of the town. You were running around, exploring and making all of the older people smile as they watched your antics (and your harried mother trying to chase after you!). 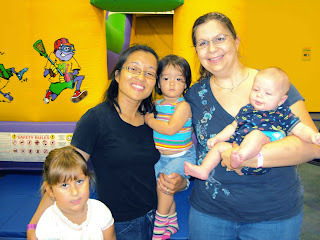 Then, we met up with Becky, Abby and Jacob Pate at Monkey Joe's. It was great to meet little Jacob, catch up with dear friends and for you, Katy, you LOVED bouncing on all of the inflatables. I'm convinced that Monkey Joe's is like childhood nirvana. After our whirlwind morning, you were wiped out and took a nice, long nap once we got home. Pop-Pop was on duty Friday night as Grandma and I went out to the movies. We saw the movie, The Help. Both of us had read the book so we were excited to see the movie. The movie was worth all the rave reviews and stayed pretty true to plot. We ended up getting home a little later than originally planned, so by the time we got home, you were a bit grumpy with me and very ready for bed. Pop-Pop had you swimming, laughing, out for a walk, playing with Pebbles- he even fed you dinner, snack and gave you a bath while we were out. Saturday morning we went to the Winter Park Farmer's Market and then spent the rest of the day relaxing and playing. Our flight left Orlando a little late because we didn't have a crew to fly the plane that was just sitting at our gate. We ended up with a whole row to ourselves, so it was nice to let you get down and play and "roam" (or as much as one can roam in 20"). 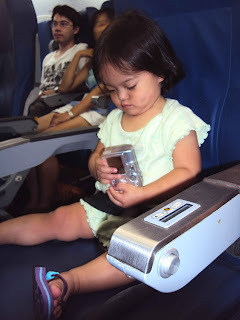 There was a little girl about 10 months, sitting in the seat behind us and the two of you kept each other entertained the whole flight. Daddy was right on time to pick us up from the airport and other than my mishap of leaving my cell phone in the bathroom behind the security line, we arrived home (late) safe and sound. 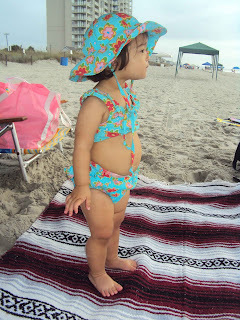 ...and there are two more bathing suits that you didn't get a chance to wear at the beach! Together with Auntie Hope, Uncle Eric, Molly, Grandma and Pop-Pop Tinkey, we went to Myrtle Beach, SC, for a family vacation- your first family vacation, Katy! The Coyles drove through the night from Pittsburgh to our house and then we caravanned over to the coast and Pop-Pop met us at the beach house. Uncle Eric's parents own the beach house, located within Oceanside Village. After unpacking and unloading the cars, a quick trip to the grocery store and naps for the girls, we decided to hit the beach. 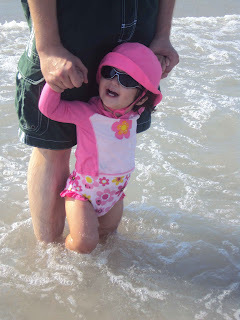 This was your first experience with sand and saltwater, Katy, and you LOVED, LOVED, LOVED the beach! I had originally thought that you wouldn't like the sand or ocean water because you hate to have your hands dirty and you don't like going into kiddie pools. However, you proved us wrong, Katy! 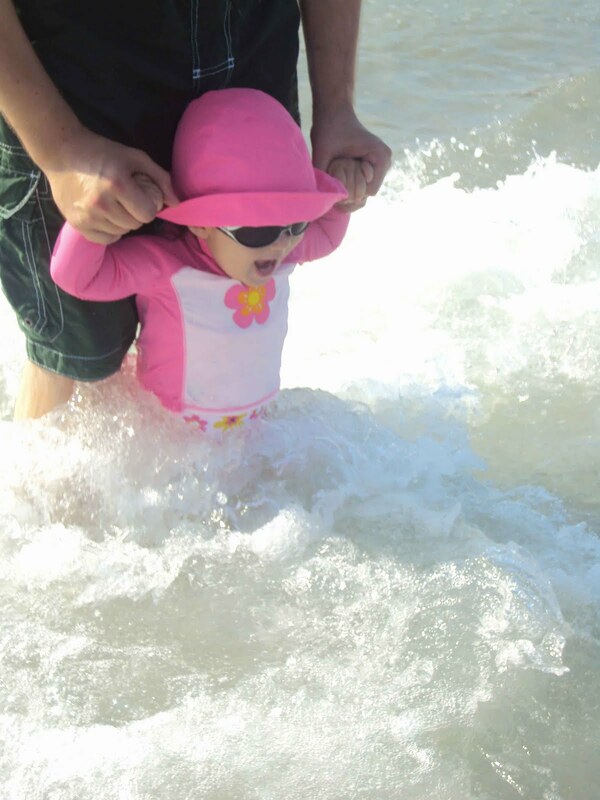 Daddy took you into the ocean while I captured the moment on camera. 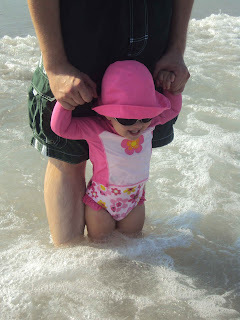 You could not stop giggling and wanting to go out further into the water. 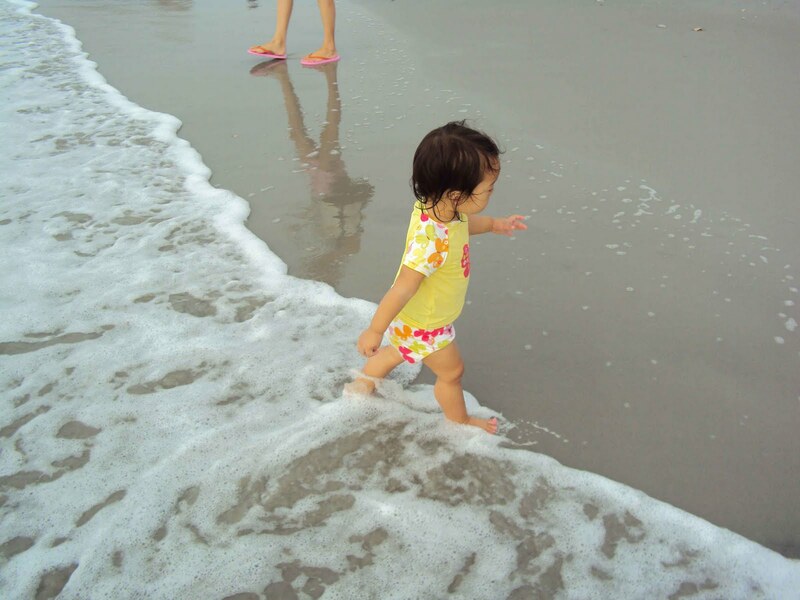 You loved splashing around and jumping into the waves! You loved the freedom of running around in the sand and more than once, Daddy and I had to make a quick dive to reach you before you reached the water's edge unattended. The next morning, we suffered through a long-winded church service at the community center. You were pretty happy and social during the service but we had to take you out of the room because the minister spoke in a whisper (not kidding!) and it was hard to hear him over your babbling and baby noises. I think the people around us were sad to see you go, Katy, as you were their entertainment for the morning. 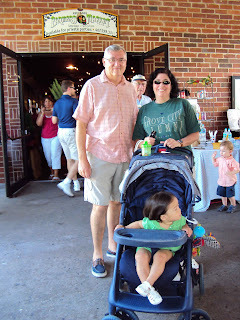 After church, we partook in the coastal tradition of dining at one of the many all-you-can-eat Calabash dinners and Bennett's Calabash Restaurant. Babies are free of charge and let me tell you, they lost money on you and Molly! Between the two of you I think you ate a whole watermelon, tons of cheese, rolls, fruit and various other goodies on the buffet! Monday morning we went to the community pool. 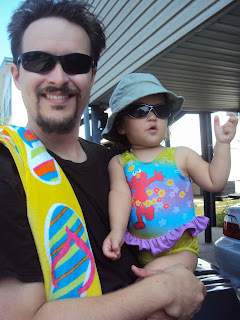 You much preferred going into the big pool with either Daddy or I, than going into a kiddie pool. We had a special float for you to sit in while we swam around the pool. You loved trying to "dunk" Pop-Pop and Daddy. We went to the Myrtle Beach Boardwalk later in the day to window shop and play a little skeeball- Grandma's favorite game. We made it a point to go into Great-Grandma Tinkey's favorite store, The Gay Dolphin, a cluttered, gift shop of oceanic proportions (pun intended). The rest of the week was filled with alternating trips to the beach and pool. The weather was quite warm while we were there- over 100 degrees! 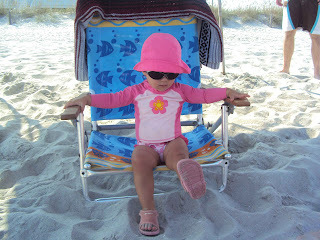 !- so we tried to go to the pool or beach early in the morning and stay inside somewhere during the afternoon hours. Katy, you had fun playing with you favorite toy, cousin Molly. Every morning you would wake up and the first word out of your mouth was , "Maaaaeeeee" or "Baby." Then, you'd go running to Molly's bedroom and see if she was up and ready to play. It was so fun to see you two play together. 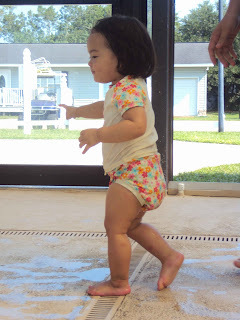 Now that Molly is walking and standing up on her own, she can keep up with you a little better. Of course, you do tend to run around the room like a whirling dervish, so it was hard for Molly to always keep up (not to mention exhausting for us to keep track of!!). Grandma and Pop-Pop Tinkey agreed to take care of you, Katy, Tuesday afternoon while Daddy and I went on an afternoon date. This was a rare treat and Daddy and I made the most of it! It's amazing what we fit into four and a half hours! We went to Ripley's Haunted House and Moving Movie Theater, saw the newest installment of Harry Potter and topped off the date with ice cream sundaes at Cold Stone Creamery. On Wednesday morning, we toured the weird, the wacky and the funny at the Ripley's Believe It or Not museum. Our family friend, Ed Meyer, was able to get us into all of the Ripley's attraction so we took full advantage of the free entertainment throughout the week. Katy, you were very good throughout the museum- there was lots to keep your attention! Thursday morning we had a private behind-the-scenes tour with the Director of Husbandry at the Ripley's Aquarium. We got to see where all of the fish are fed, how they are fed, the generators, tanks and even where the "mermaids" dive into the tanks. A BIG turtle came to greet us when we were looking at of the the behind the scenes tanks. You loved looking at all of the fish and the other little kiddies! It was nice to be inside in AC during the heat of the day and we had fun observing all of the sea life. After the Aquarium, we went to Carlos and Charlie's for lunch. You had a meltdown in the restaurant which ended up with us ordering our food to go and a long car ride home (to the beach house) as you slept in the backseat. Friday was our last full day at the beach so we woke up and spent most of the morning/early afternoon splashing in the waves, taking a walk along the sand and enjoying a (sandy) lunch. We woke up early Saturday morning, straightened up the beach house and then all parted ways. 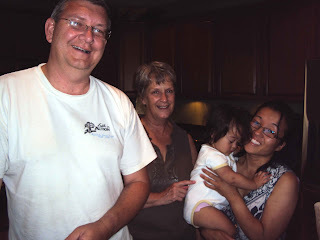 Daddy had to go back home to go to work and Auntie Hope, Uncle Eric and Molly went to visit other family in North Carolina. However, you and I got to go home to Florida with Grandma and Pop-Pop for another week of vacation in Florida. All in all, our week at the beach was relaxing and enjoyable. It was fun to have some unstructured time enjoying family and experience your first time at the beach, Katy. Judging from your reaction to the beach this time, I have a feeling this will definitely not be our last trip to the beach!